Expanded version of Costa Mesa neighborhood favorite mixes in exclusive, ambitious entrées along with casual favorites. 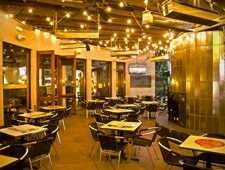 : Housed in the southeast corner of an enormous retail and dining complex, this casual independent restaurant brings a welcome alternative to inland South Orange County’s relentless network of chain eateries. This outpost is roughly twice the size of its original, sister location in Costa Mesa, resulting in a wider, breezier space that mixes in large windows and colorful accents with rustic adobe motifs. The menu is filled with Mexican food staples like burritos and enchiladas, comforting plates featuring mains such as carne asada and mahi mahi, and a caramel churro sundae for dessert. However, chef Angel Velazquez utilizes the roomier kitchen to bolster the offerings --- think simply prepared items like refreshing shrimp ceviche and steak empanadas as well as more complex entrées, perhaps a carnitas brisket served with jícama slaw. The nicely appointed bar is also a relaxing place to enjoy a margarita or one of over 75 tequilas. On Sundays, chilaquiles and chorizo and eggs can start your day at brunch.